​to take home with you as a memory of a great day for a great cause! $3 from the sale of each t-shirt goes to the cause! 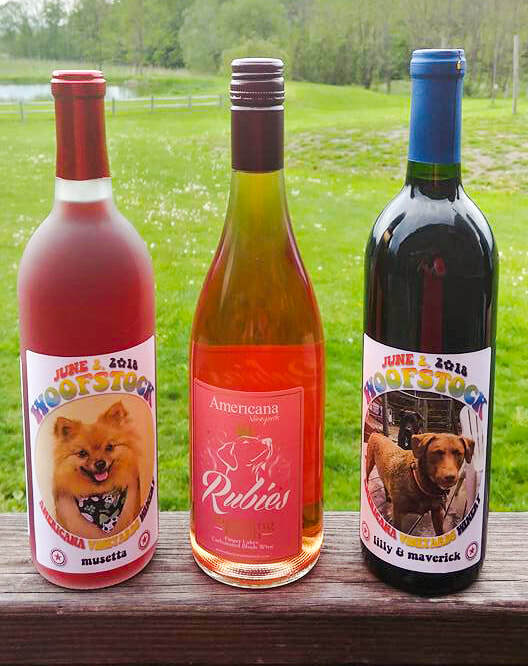 Buy 4 bottles of any wine in the Winery and we'll create custom wine labels with your fur baby on the label! You can bring an electronic pic with you or we can take a picture for you the day of the event. These labels are ONLY available during Woofstock! These limited edition Woofstock doggie bandanas are available at the Pink Peony booth for $7.50 each, with $2.50 going to the rescues and shelters of Woofstock. Available in Large & Small!